"Olosega" redirects here. For other uses, see Olosega (disambiguation). 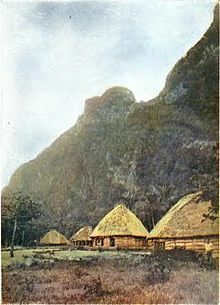 Ofu and Olosega are parts of a volcanic doublet in the Manu‘a Group of the Samoan Islands—part of American Samoa. The twin islands, formed from shield volcanoes, have a combined length of 6 km and an area of 12 square kilometers (5 square miles); their population is about 500 people. They are geographic volcanic remnants separated by the narrow 137-meter-wide (449-foot) Asaga strait, a natural bridge of shallow coral reef. Before 1970, one had to wade between the two islands at low tide; now a single-lane road bridge over the strait connects villages on Ofu island with those on Olosega. South shore of Ofu seen from Olosega across the narrow strait that separates them. The sharp peak, an eroding dike complex, is named Sunu‘itao. Ofu is the western part of the volcanic outcrop of Ofu-Olosega Island. The main village of Ofu is located on the western shore, protected behind an offshore islet (eroded tuff cone) known as Nu'utele. Ofu has a small airport ( IATA: OFU, ICAO: NSAS) and a boat harbor that serve the population on Ofu and Olosega. The weekly flight from Pago Pago takes about half an hour. Most of the southern shore and associated coral reef are part of the National Park of American Samoa. In 2005 the U.S. National Park Service was negotiating with village councils on Olosega to expand the park around that island. The island forms the Ofu County subdivision of the Manua District. It has a land area of 7.215 km² (2.786 sq mi), and had an official population of 289 persons as of the 2000 census. Situated on the south coast of the island is To'aga lagoon which has a high diversity of corals and fishes. The marine site has been part of long term research and study on coral reefs and global climate change. The island is also home to the Samoa Flying-fox (Pteropus samoensis), a species of bat threatened by habitat loss. Aerial view - Olosega village on the right, Ofu on the left. Both islands are connected via a single-lane bridge, crossing the Asaga strait. Olosega Island is a remnant of the Sili shield volcano, the caldera of which may lie submerged off the north shore. The volcanic eruption of 1866 was actually 3 km (1.9 mi) east of Olosega, on a submarine ridge that extends east southeast to nearby Ta‘ū. The island forms the Olosega County subdivision of the Manua District. It has a land area of 5.163 km² (1.993 sq mi), and had an official population of 216 persons as of the 2000 census. There are four villages on Olosega: Olosega, Lalomoana, Sili and Faiava. ^ "Global Volcanism Program, Ofu-Olosega". Smithsonian National Museum of Natural History. Retrieved 13 July 2010. ^ Jason Tyler, Patric V. Kirch, Terry L. Hunt, Lisa Nagaoka (November 1989). "Final Report on Archaeological Investigations at Site AS-13-1, To'aga, Ofu Island, American Samoa". Department of Parks and Recreation, Government of American Samoa. Retrieved 13 July 2010. Office of the Governor. 2004. Manu‘a ma Amerika. A brief historical documentary. Manu‘a Centennial. 16 July 1904. 16 July 2004. Office of the Governor, American Samoa Government. 20 p.
"Ofu-Olosega". Global Volcanism Program. Smithsonian Institution. Persistence of Coral Reefs Under Extreme Environmental Stress in American Samoa G. Piniak, C. Birkeland, and G. Garrison (2004). University of Hawaii.